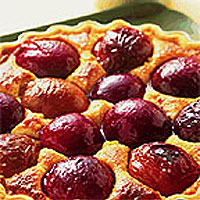 English dessert plums are sweet and juicy and have a natural affinity with almonds. The popular Victoria plum is in season from mid-August until early September. Look out for other English varieties such as Opal, Swan and Marjorie Seedling during these two months. Preheat the oven to 200°C, gas mark 6, and place a baking tray in the oven to preheat. Roll out the pastry and use to line a 23cm, loose-bottomed, fluted flan tin. Spread half of the plum conserve over the base. Cream together the butter and sugar until light and fluffy, using an electric mixer, then beat in the eggs. Stir in the ground almonds, almond essence and flour, then spread on top of the jam over the pastry base. Top with the plums, skin side up, arranged in circles starting from the outside, until the mixture is covered. Place on the preheated baking tray and bake for 40-45 minutes until risen and set. Heat the remaining plum conserve with 1-2 tbsp cold water in a pan over a gentle heat until the conserve has melted. Sieve to remove any large pieces of skin, then brush over the top of the tart. Serve in slices, either warm or cold, with single cream. Placing the flan tin on a preheated baking sheet helps to crisp the pastry base. This saves time as it is not necessary to bake the pastry case blind before adding the filling. Remove the pastry from the fridge about 20 minutes before using, then roll out while still cold. Wrap the remaining pastry with clingfilm and store in the freezer for up to 1 month. This recipe can also be made using other soft, stoned fruit, such as apricots or peaches.